syntax highlighting supports all sorts of D2 style strings. statements disabled by version or debug conditionals are displayed in a slightly different color. Debug and version identifiers and levels can be defined in the same source file or in the current project configuration. The compiler predefined version identifiers are also recognized. 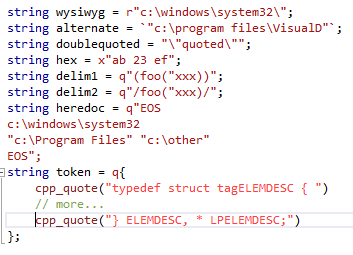 code in token string literals are highlighted in another slightly different color than regular code. highlighting colors can be setup in the "Fonts and Colors" page found in the Tools->Options Dialog. In addition to the regular colors, you'll find "Visual D Disabled ..." colors for the code disabled through version statements and "Visual D Token String ..." colors for the code in token strings. Selecting "Open Language options" from the Visual D Menu will take you directly to the global options page for code completion. This is where you can configure what happens if you want to see code completion. Expansions from semantic analysis: the semantic engine will try its best to figure out the current scope of the edited text and find valid identifiers. If no matching identifier is found or if you trigger expansion again, expansions from the text buffer or JSON browse information will be added. Expansions from text buffer: completion will show identifiers in the vicinity of the caret from the same buffer (default short-cut Ctrl-Space). If no matching identifier is found or if you press the short-cut again, identifiers from JSON files are also displayed. Expansions from JSON browse information: completion will show matching identifiers from the compiler generated JSON files. No information about the current edit scope will be used. 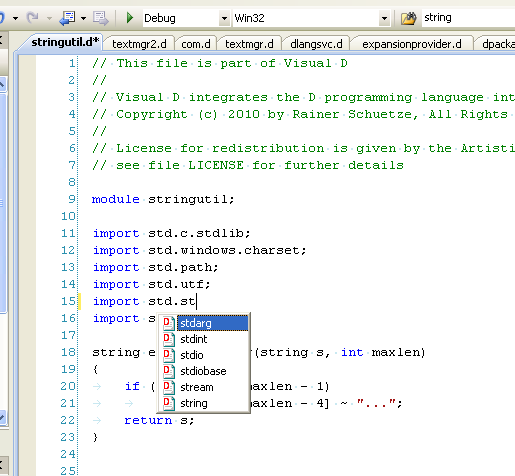 Show expansion when: sets the trigger for showing the code completion popup. Using a mode that displays completion more often also includes the other triggers, i.e. 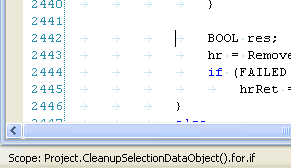 hitting Ctrl+Space is always possible to display completions. Show type of expressions in tool tip: Display information about the hovered identifier in a tool tip. Use semantic analysis for "Goto Definition": goto definition (default short-cut F12) can either request the location of the definition of a symbol from the semantic engine or takes information from compiler generated JSON files. A successful build with JSON output enabled is necessary for the latter. JSON files can also be precompiled and placed into the directories given in the global options. If there are multiple definitions for the identifier at the caret position, the Search Window will show up. Use Alexander Bothe's D parsing engine: Use the semantic engine that also powers Mono-D and D-IDE. It is more powerful than the engine that is part of Visual D. You must have installed it from within the Visual D installer. Triggering completion an import statement will always complete the token from the files and folders available in the import directories. smart indentation will indent nicely after pressing Return. parameter info tooltips (default short-cut Ctrl-Shift-Space) showing function prototype and highlighting current position in argument list. As with "goto definition" this feature relies on JSON files being generated. This command is also accessible from the Visual D menu, but it is best to assign it to some keyboard shortcut. 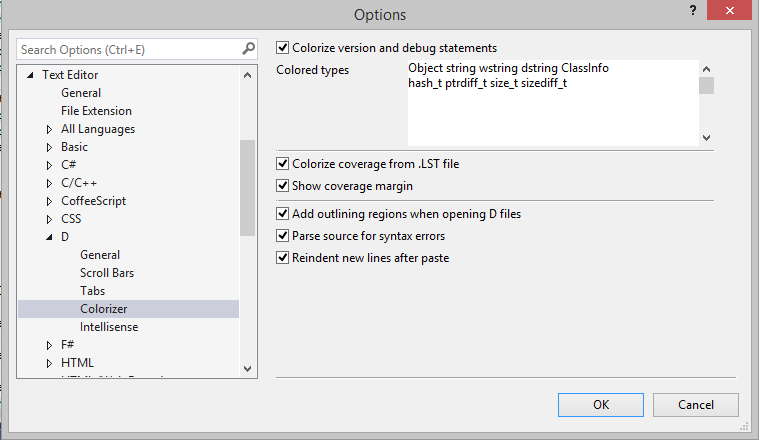 Automatic outlining can be disabled on the global configuration page "Tools->Options->Text Editor->D->Colorizer". Using command "Outlining->Collapse to Definitions" will enable it for the current text buffer. Two commands are added to the "Edit->Outlining" menu: "Collapse unittests" will fold away unittest blocks that might obfuscate the actual code if they become excessive. "Collapse disabled code" will hide code blocks actually not compiled due to version or debug conditions helping you concentrate on the active code. show the clipboard ring in a context menu to paste from. This operation is invoked by the "Edit->Cycle Clipboard Ring" command.